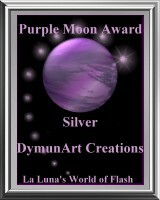 Congratulations, you have been awarded, The Purple Moon Silver Award. Many congratulations also for all that you have achieved with your site. your colours are harmonious and pleasing to the eye. Good luck to you in all your future endeavours. Thank you in allowing us to evaluate your site. Our very best regards to you. Jean and the Purple Moon Award team.